Knight Guardian is a fun take on the classic, dark knight super-hero. Players toss the included "batarangs" at the villainous targets, and are awarded points accordingly. It's a fun challenge for all ages. 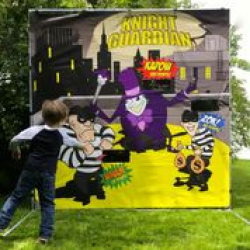 Kids love this exciting 7'x7' frame game.